We are living in a golden age for space exploration and the world-wide interest in planetary surface exploration, with particular regard to future robotic and human missions, is rapidly increasing. Many nations can maintain robust space programs that continuously deliver a great amount of highly complex datasets. These data can be used for the production of Geological maps which provide the context for all observations and interpretations of surface and subsurface processes on any planetary body and their histories. Up to date geological maps of planetary bodies are released on a regular basis only by the United State Geological Survey which follows a standardized production of map quadrangles. However the great amount of highly differentiated dataset from planetary missions calls for innovative non standard products and established networks of institutions and scientists all over the world devoted to geological mapping and 3d geo-models. It is high time to maximize the scientific output of planetary missions and improve the position of Europe in this context. 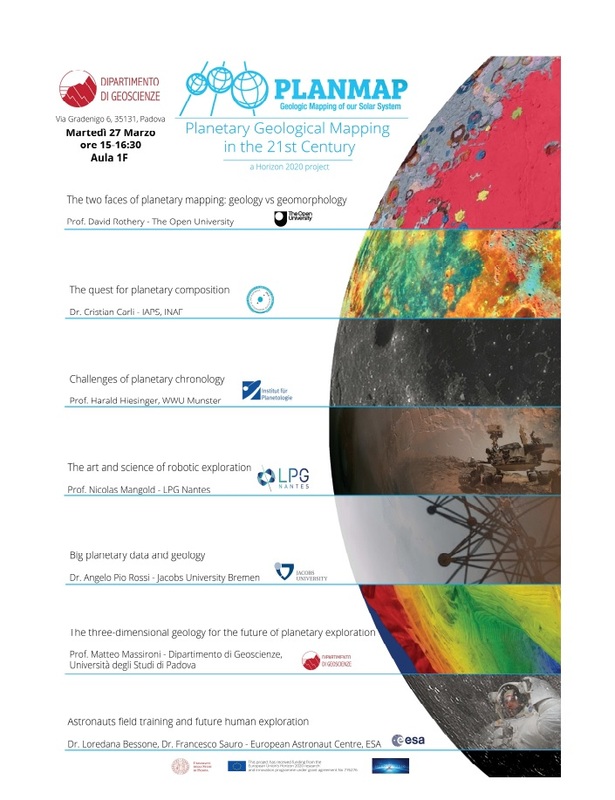 PLANetary MAPping project (PLANMAP) aims at providing highly informative geological maps of the three main bodies of interest for European space missions in the next decade: Mars, Mercury and the Moon. These maps will include spectral information, elemental composition, absolute ages and ground truth information. They will also provide the basis for subsurface 3D geological modelling, and will be disseminated using dedicated web-GIS software. PLANMAP is a Horizon2020-COMPET4 project with the major aim of developing an efﬁcient European network for geological planetary mapping which, exploiting the available datasets, can provide new products complementary to the existing ones, starting with the three main bodies of interest for Europe in the next decade: Mars, Mercury, and the Moon. The kick-off meeting of PLANMAP project was held on March 26th-27th-at the Department of Geosciences of the University of Padova. This project receives funding from the European Union Horizon 2020 research and innovation program under grant agreement N. 776276.